Designed in 1981, JL 85 and it’s companion side chair JL 68 were the last chairs designed by Niels Møller for the Company he founded 37 years earlier. The designer died the following year,. Both chairs have slightly heavier proportions than many of Møller’s previous chairs as the designer choose to use more substantial timber sections in their construction as he had for chairs JL84 and JL67 he penned five years earlier. and JL68 have higher backs than earlier models and the thicker more rounded sections provide a broader area of support for the lower shoulders back and lumber region of the back. The construction of both chairs includes the strong interlocking mortice joints typical of Møller’s designs which alleviate the need for additional stretchers. 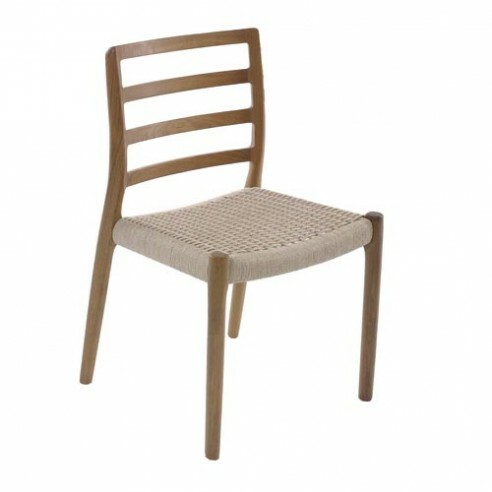 This detail lightens the appearance of the chairs which are produced in a wide range of solid timbers with either woven cord or upholstered seats.